Posted on October 7th, by Dr Rob Yeung . Technically, this is an open-ended question that invites you to say whatever you want. For example, I observed a 40-something-year-old manager who started her answer by talking about her school days and then university. She also mentioned how proud she was about her children. But the interviewers were not impressed because none of it was relevant to the job that she had applied for. If you are asked by interviewers to talk about yourself, imagine that you hear a different question: “Tell us a few things about you that make you a strong candidate for this job.” Spend just a few minutes talking about things that are recent and relevant. For example, talking about your work experience over the last 3 to 5 years is much, much more relevant than either your work experience or studies of say 10 years ago. But my advice is that your answer to this question should depend entirely on the requirements of the role. So if the job advert mentioned first and foremost that they are looking for someone who is motivated, then you should of course talk about your motivation levels. But if “high motivation” or “motivated” is not mentioned in the job advert, then you are effectively telling the interviewers that you have a strength that is not relevant to what they are looking for! Yes, you may think that being motivated is a good thing. 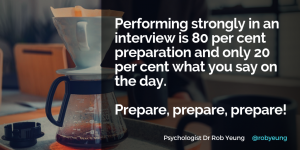 But if the advert mentions things like “financial skills” or “telephone manner” or “ability to inpire others” – then that’s what interviewers will want to hear candidates talking about when responding to a question about strengths. I should point out that well-trained, effective interviewers never ask this question. When I am training managers in how to interview candidates more rigorously, I explain that this is a really poor question in terms of distinguishing between good and bad candidates. However, many untrained interviewers continue to ask the question! Often, untrained interviewers believe that this question is a good guide as to whether candidates have any self-awareness about themselves. These untrained interviewers are wrong (!) but you must of course answer the question if it is asked of you. The way to answer this question is to make sure that you tell the interviewer about a weakness that has nothing to do with the job. For example, if you’re applying for a job that will be based in the UK and speaking only in English, then you could explain how difficult you found languages when you were at school. Or, if you’re being interviewed for a role as a software engineer, then you could talk about how you don’t like writing reports or anything else that isn’t likely to come up on the job. These are not a part of the formal interview process, but remember, remember, remember that you are still being judged on your overall personality. So if you answer “How was your journey?” with “Fine thanks”, then you are come across as someone who doesn’t have a lot to say. Try instead to get a bit of chat going. Even if you had a terrible journey, try to say something positive rather than come across as a moaner – perhaps “I don’t really know this part of town so I quite enjoyed seeing how much greenery there is on the way here. How is your journey usually?” By answering with more than a few words – and by including a question too – you help to create a chattier, more pleasant impression. And if it comes down to the interviewers having to pick between several candidates who all have more or less similar skills, then of course they will pick the person they like the most.